The Individuals with Disabilities Education Act (IDEA) requires school districts to assess children “in all areas of suspected disability.” It further provides that each child’s individualized education program (IEP) must contain measurable annual goals designed to “meet each of the child’s . . . educational needs that result from the child’s disability,” and a statement of special education and related services that will be provided for the child “to advance appropriately toward attaining annual goals.” Courts have strictly enforced these requirements in the last several years, remedying violations of IDEA when school districts fail to assess in all areas of suspected disability or do not establish goals and services to meet each of the child’s needs resulting from the disability. This Article offers three interpretations of this recent development. First, what the courts are doing may represent an effort to enforce provisions of IDEA that stand apart from the limited reading that a 1982 Supreme Court case placed on the requirement in the statute to provide a free, appropriate public education. 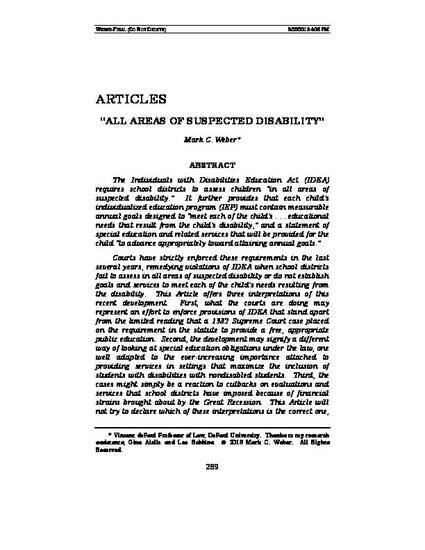 Second, the development may signify a different way of looking at special education obligations under the law, one well adapted to the ever-increasing importance attached to providing services in settings that are less restrictive and maintain the greatest inclusion of students with disabilities with nondisabled students. Third, the cases might simply be a reaction to cutbacks on evaluations and services that school districts have imposed because of financial strains brought about by the Great Recession. This Article will not try to declare which of these interpretations is the correct one, and in fact all three may be true. But the Article will conclude that enforcement of these provisions furthers the underlying purposes Congress had in enacting IDEA.